Software systems are becoming ever more complex, as the capabilities of the software upon which they are based increase. To develop software that is manageable, we must look for novel sources of inspiration, rather than requiring an increasingly costly level of human support. Self-organising software suggests benefits in this direction, and this chapter focuses on a particularly relevant area of inspiration, that of natural systems. Indeed many natural systems are themselves self-organising, despite being often very complicated. We consider natural systems both in the context of non-living (mathematical, physical and chemical) and living (cellular, invertebrate and vertebrate, not excluding human beings) examples. We review some of the causal mechanisms and conditions that are fundamental to self-organisation in natural systems, such as: complexity, evolution, ecological interactions, animal behaviour, as well as the complexities of human behaviour, which has given us insights into phenomena such as small-world networks, epidemics, trust and gossip. 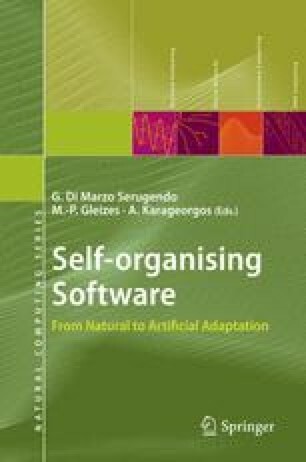 In each case, we consider the relevance to self-organising software, and we throughout provide a range of references to applications and to other chapters where particular areas will be developed in more detail. We conclude by considering two application areas which arise frequently in the context of self-organising software, in different contexts: trading in markets, and networks when considered from the perspectives of design, management and robustness. Self-organisation in software offers advantages in dealing with dynamic environments and extensive communication loads. Nature is the teacher we humbly have to follow, and learn from its examples. Paul Marrow’s research is supported by BT’s Strategic Research Programme and Digital Home Research Programme. He also acknowledges the support of the EU project CASCADAS (IST-FP6-027807) in his research on self-organising systems.